Welcome to the Miami, OK Buffalo Run Hotel located on the grounds of the Buffalo Run Casino. 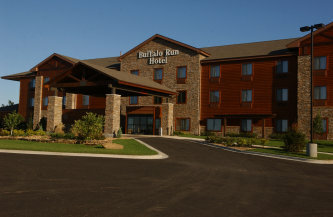 The Buffalo Run Hotel features charming décor and comfortable amenities in the 100 rooms including 12 one room king bedded suites that feature a wet bar and sitting area. When you’re looking for Miami, Oklahoma Hotels, consider our inviting list of complimentary amenities. We strive daily to make our guests feel at ease. As part of that commitment,we offer a range of amenities to make your stay as comfortable as possible. Treat yourself to a relaxing dip in the pool at the end of a long day.